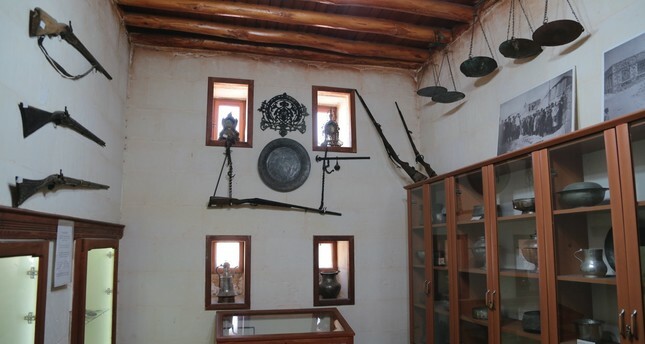 Journalist Ali Atalar, who started collecting copper items while in high school out of curiosity, opened the Hidden Mansion museum in a historical house in Gaziantep province in 2011, where he exhibits 1,630 pieces, mostly copper, but also weapons, scissors, stamps, embroidery and handwriting book collections. A 300-year-old pitcher once having belonging to the wali of Egypt Said Pasha, a 250-year-old plate once belonging to Hüseyin Pasha and a rifle from the Turkish War of Independence attract much attention. 1,630 pieces, mostly copper, but also weapons, scissors, stamps, embroidery and handwriting book collections are exhibited at the museum. Atalar told Anadolu Agency (AA) that he satiated his curiosity by becoming a collector, starting with copper items. His first step as a collector began in 1980 with a copper pan inherited from his grandmother, and he has been collecting ever since. "I started to collect copper items in particular, which are an essential part of the culture of Gaziantep. When I didn't have a place to put the pieces I collected, I decided to open a museum. I bought and restored a house and brought my collection for visitors. Having pieces you collect isn't important. You should share them, as well," he said. Explaining that he has continued to collect after opening the museum, Atalar said: "I have collections of weapons, stamps, handwriting books and embroidery along with copper. I try to increase the quality of the pieces, not the number. For example, I try to find pieces from the Ottoman era on which the names of their owners are written or stamped. I visit antique bazaars and historical places in every city I go to. Some things I bought in Istanbul and Aleppo. I try to buy them from all over Turkey. However, the pieces mostly come from Gaziantep." He explained that he wants the city to be mentioned for its history and culture apart from its gastronomy, and he does his part with his museum. Since collecting is a passion, Atalar said that he paid his spiritual debt with the museum: "I want to provide a cultural service. I was born, raised and educated in this city. It brought me to where I am now. It made me a journalist. So, I should give something back. If you earn your living in a city, you should pay it back in a way. I just wanted to pay my debt, opening this museum. I've also written nine books about Gaziantep's history, handicrafts and copper. What matters is to introduce the city and increase the number of people who visit. We need to tell people that Gaziantep isn't just a food city, it also has history and culture. It is one of the safest cities in Turkey. You can walk around at night until daylight." Atalar also said that taking up collecting as a hobby can ward off bad habits.